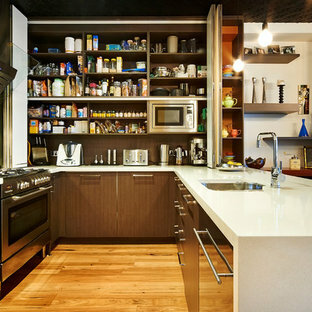 Design ideas for a contemporary kitchen pantry in London with flat-panel cabinets, black cabinets and porcelain floors. 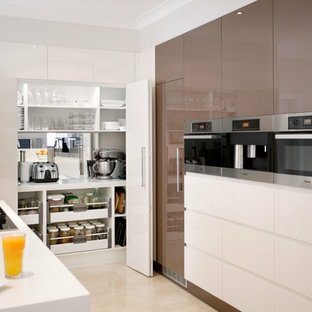 Photo of a contemporary kitchen in Sydney with a drop-in sink, flat-panel cabinets, white cabinets, grey splashback and glass sheet splashback. 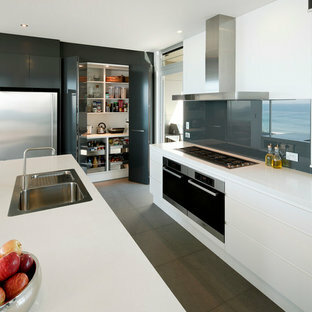 Inspiration for a contemporary kitchen in Sydney. Corian Large Island Bench Top in beautiful home in Bulleen. Custom made and designed to suit existing floor plan. This is an example of a mid-sized modern kitchen in Melbourne with an undermount sink, flat-panel cabinets, white cabinets, solid surface benchtops, stainless steel appliances, ceramic floors and an island. Inspiration for a contemporary u-shaped eat-in kitchen in Perth with an undermount sink, flat-panel cabinets, dark wood cabinets, stainless steel appliances and medium hardwood floors. 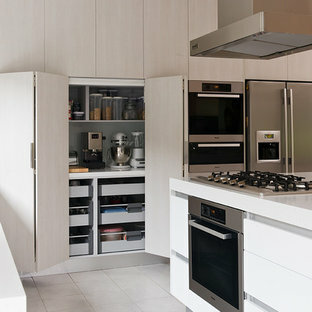 By Briggs Design Associates, Inc.
Bi-Fold larder hiding worktop clutter. Transitional kitchen in Dublin with beaded inset cabinets, grey cabinets, quartz benchtops and an undermount sink. 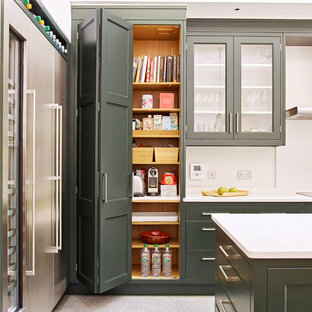 Design ideas for a contemporary kitchen pantry in London. Enclosed a a collection of vintage storage, serving platters and delicate tea cups and saucers. Blum motion soft close drawers contain the perishables and a large integrated Fisher & Paykel fridge freezer drawer adapts to any occasion. the over bench shelves have concealed LED lighting to offset the pendant ambient lighting. This open kitchen and living design meets the lifestyle needs of an active household and encourages guests to hang out or join in the food prep when entertaining. The bright, open transitional style strikes the perfect balance between traditional and modern design schemes. Design ideas for a mid-sized transitional kitchen in Charleston with grey cabinets, recessed-panel cabinets and an island. The back wall previously featured three sets of French doors leading on to the garden. These were removed in favour of bi-fold doors stretching the full length of the wall, these modernise the space and introduce increased natural light. The deep blue used on the island is quite a contemporary tone which sits well alongside the newly installed bi-fold doors. 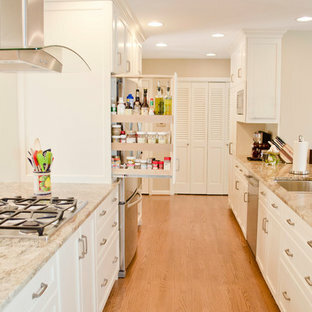 The custom bifold doors open out to create space that is easily accessible to the main kitchen. Design ideas for a mid-sized contemporary l-shaped open plan kitchen in Sydney with an undermount sink, shaker cabinets, white cabinets, granite benchtops, white splashback, stone tile splashback, stainless steel appliances, porcelain floors and an island. 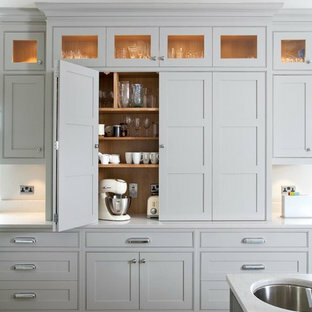 Traditional kitchen in Hampshire with recessed-panel cabinets and beige cabinets. 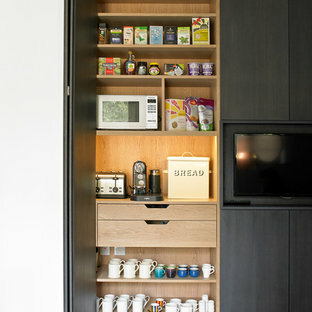 Working pantries can also be created in the form of a closet as shown here. 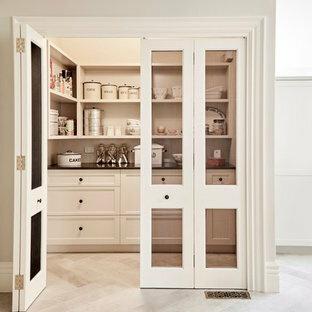 The least expensive pantries typically are closets with a plastic laminate countertop and exposed shelving hidden by full height bi-fold doors. 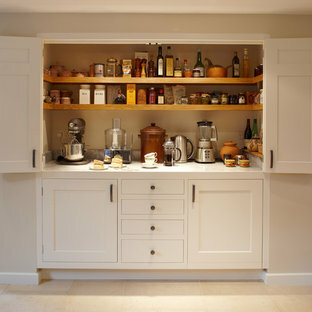 A walk-in closet style pantry can become a working pantry as opposed to just a storage pantry simply by adding a real worktop. 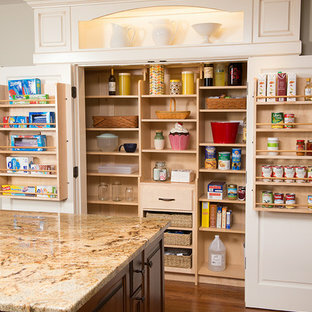 In a YesterTec Kitchen that has the 3 major workstations (Sink, Range and Refrigerator), a working pantry is a great addition to conceal all the small appliances and add extra work space.